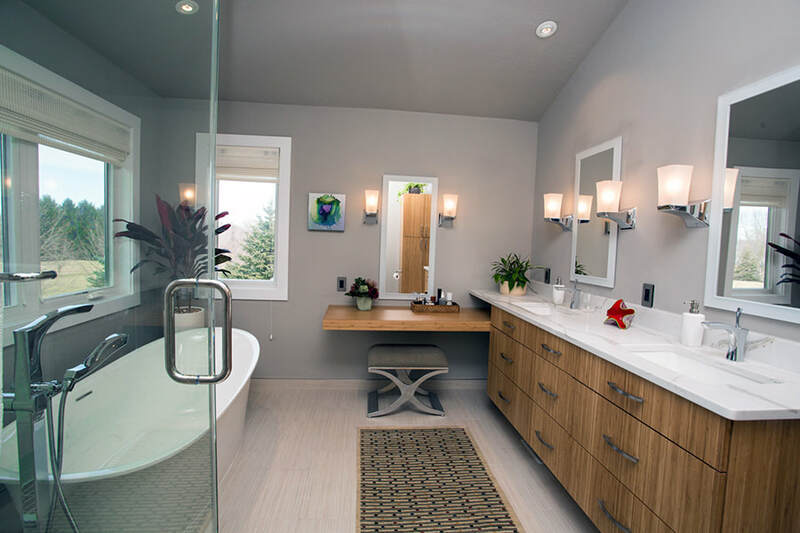 This bathroom has a high-end feel with a natural design. 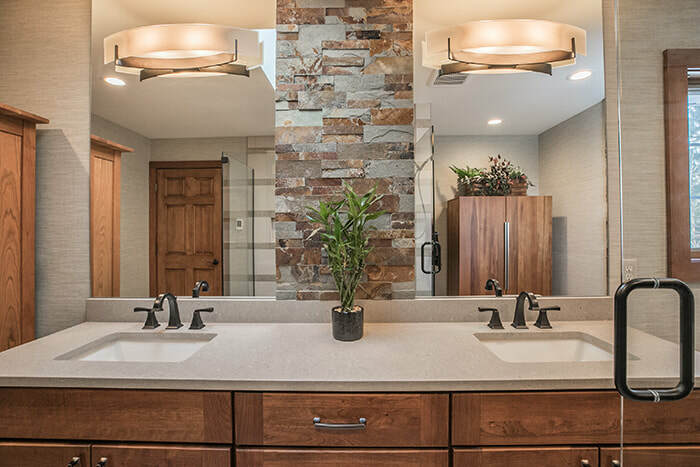 Earth tones and stone work prove relaxing, while modern amenities like a dramatic walk-in shower, dual vanity and a his & hers walk in closet takes it to the next level of "Wow!" 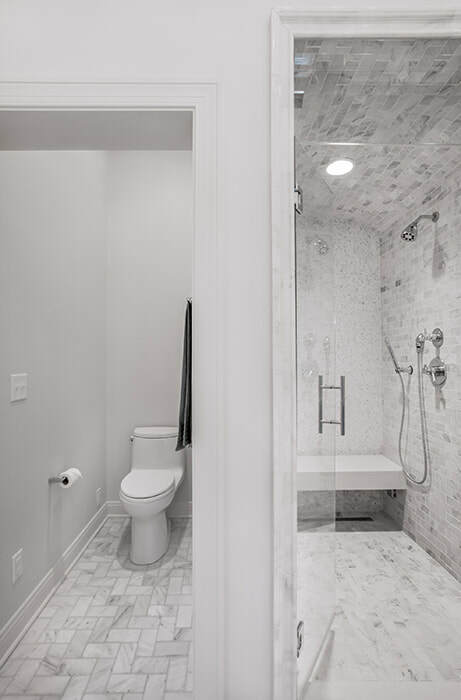 The sleek soaking tub will draw your attention, but don't miss the nearly zero-lip walk-in shower, separate vanity locations and a private toilet room. 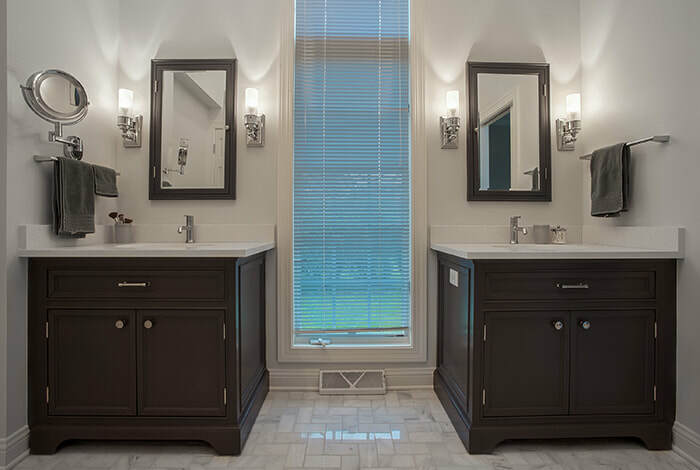 The light earth tone colors and white woodwork provide a calming and soothing atmosphere while keeping a high-end look. 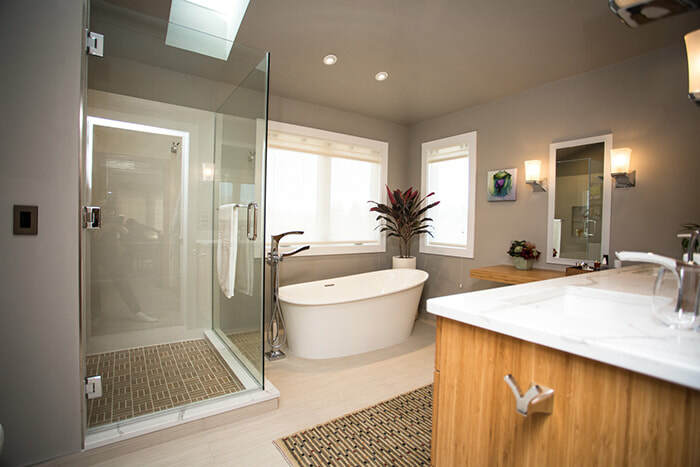 This custom home client wanted three full baths in their custom home - A master, larger "kids" bath, and a full main floor bath. 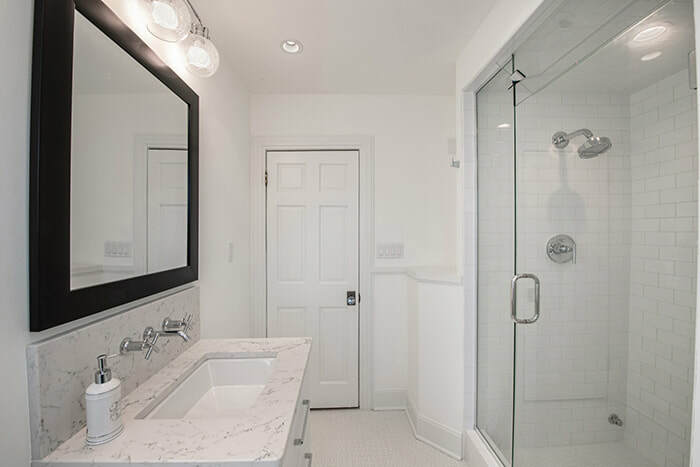 The master includes a large double vanity and walk-in shower with gorgeous tile work. 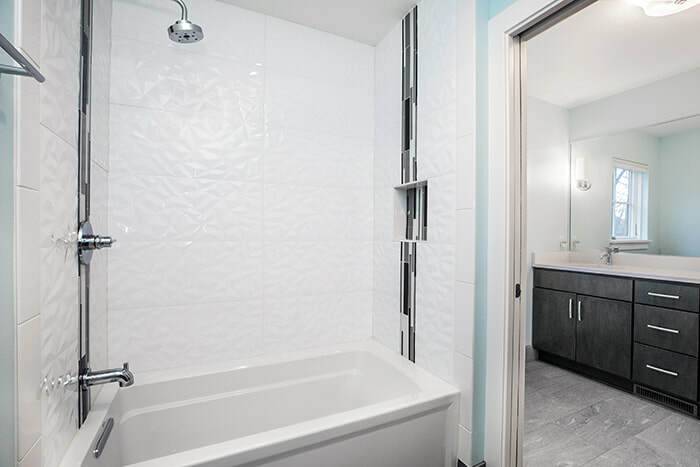 The kids bath has a large vanity area to accommodate everyone, and the toilet and shower are in a separate room with door so people can use both areas at the same time. 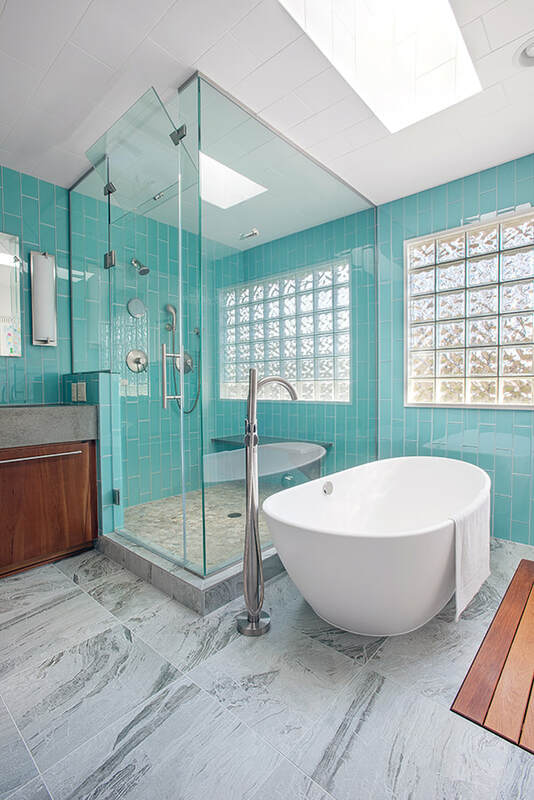 All three baths have similar tile and woodwork, tying them all together. 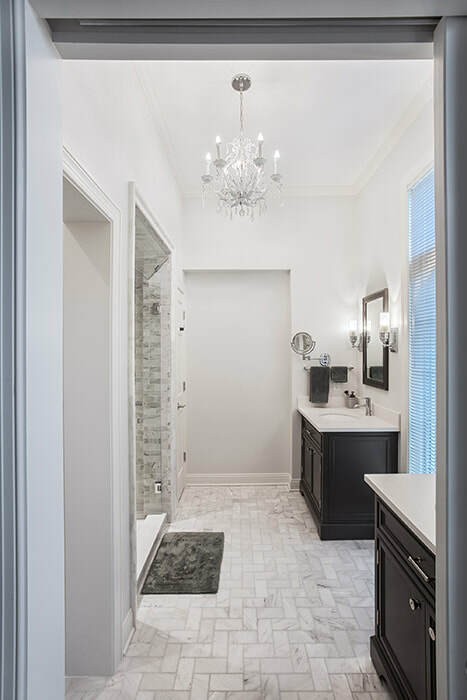 Dark cabinetry and bold paint colors contrasted against the light colored counter-top on the dual vanity and earth-toned tile work of the walk-in shower create a bold and impressive space. 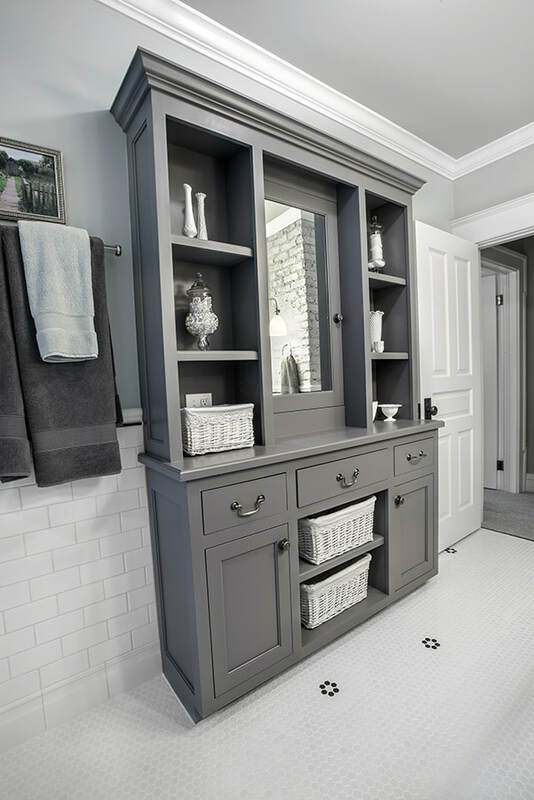 The colors make a statement, but it's the details which bring it all together. 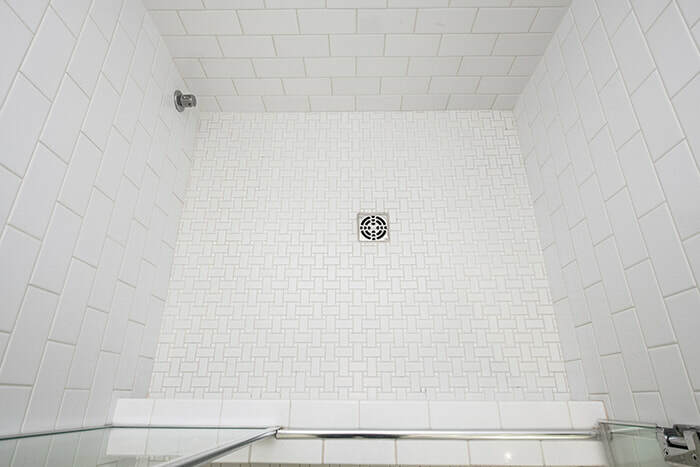 The floor tile was replaced with natural wood flooring outside the soaking tub for a safer, less slippery option. 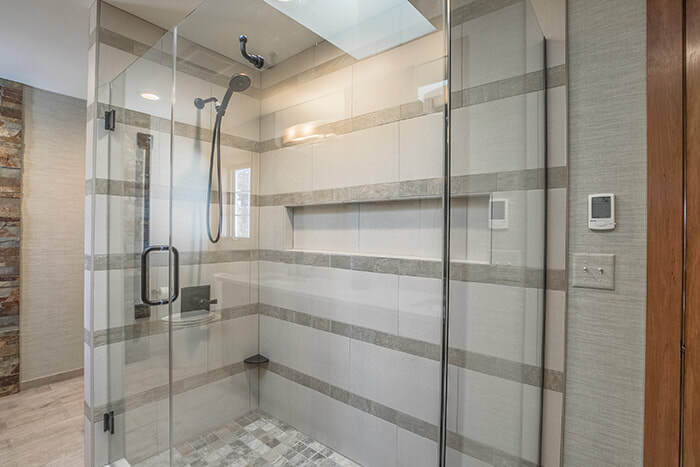 The large glass block window provides light, privacy and a design element, and did you notice the glass "vent" above the shower door? 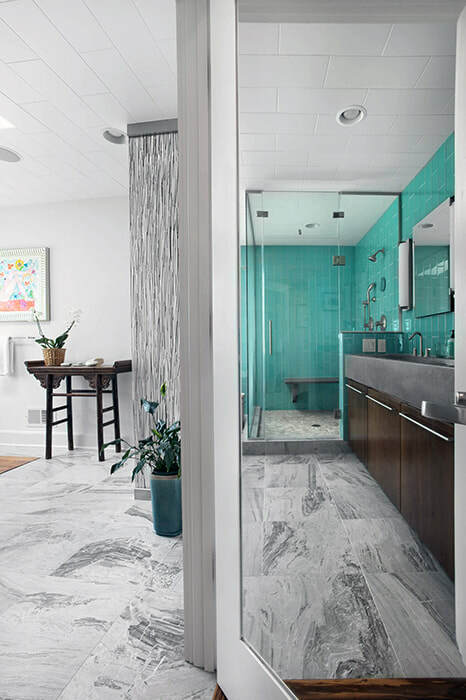 A great blend of colors, textures and finishes make for an impressive space. 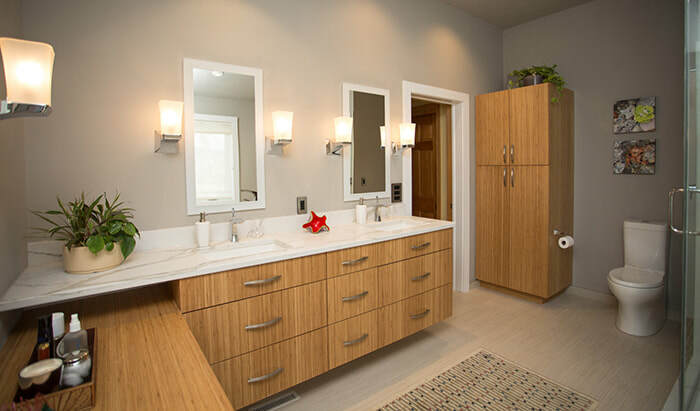 With it's clean lines, monotone finish, tiled walk-in shower, a wall mounted vanity faucet and even a radiator, this contemporary Shorewood bathroom gives off a very retro feel. 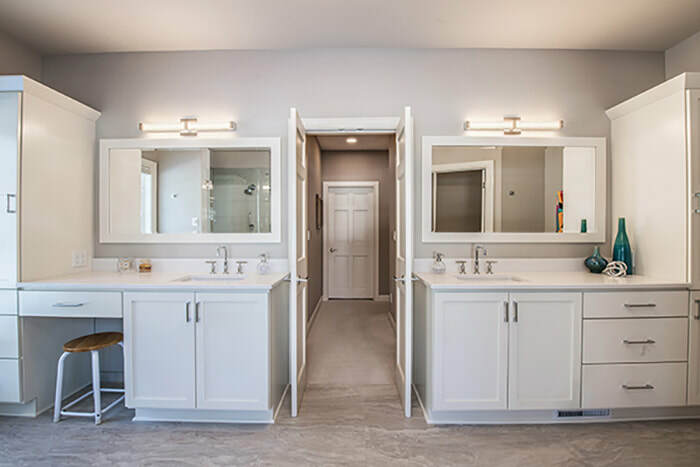 This master bathroom features separate vanities, an amazing walk-in shower with bench seating and a well-hidden toilet area. 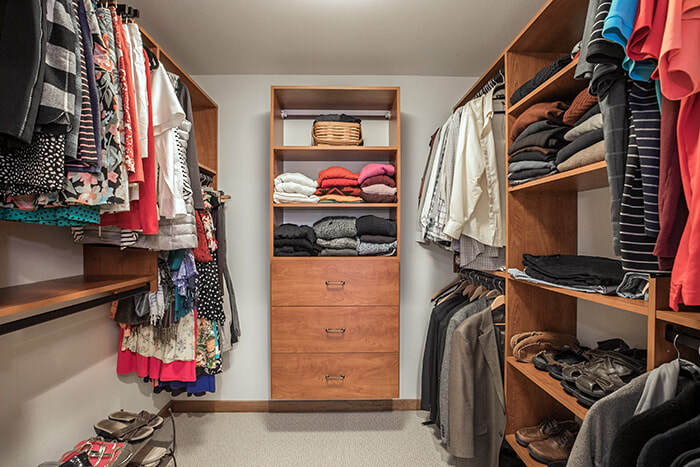 While the space is limited, the outcome was not. 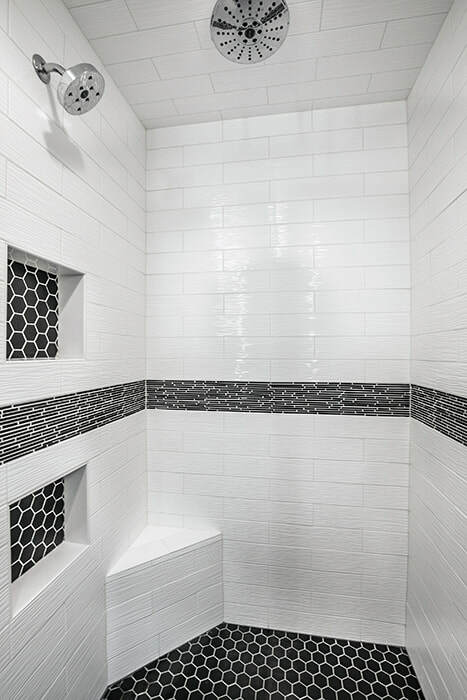 A bold and stylish walk-in shower with unique tile work, along with an elegant and simple vanity make the most of a smaller space. 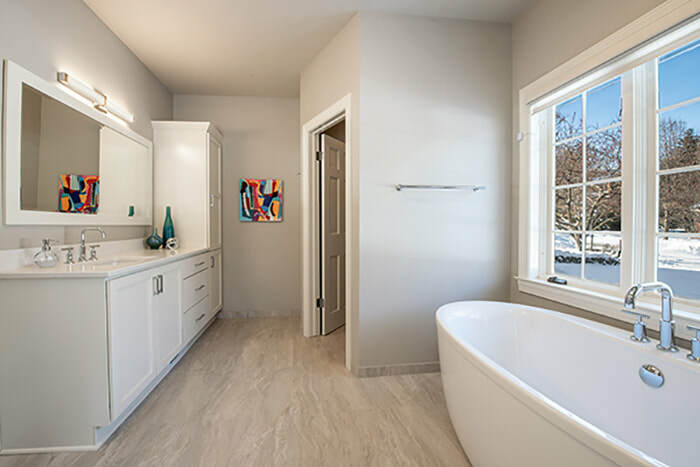 These Whitefish Bay homeowners built a two-story addition and added an all new master suite which included this wonderful master bath. 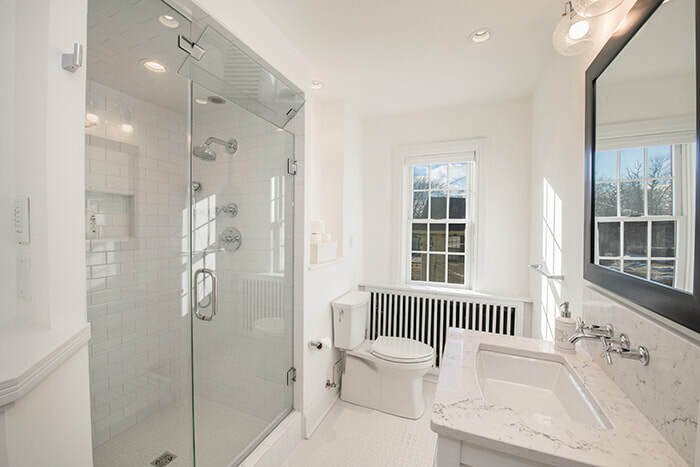 A giant soaking tub, large walk-in shower with bench seating, dual-vanity and a private toilet area create a perfect space for two, with plenty of room and tons of natural sunlight. 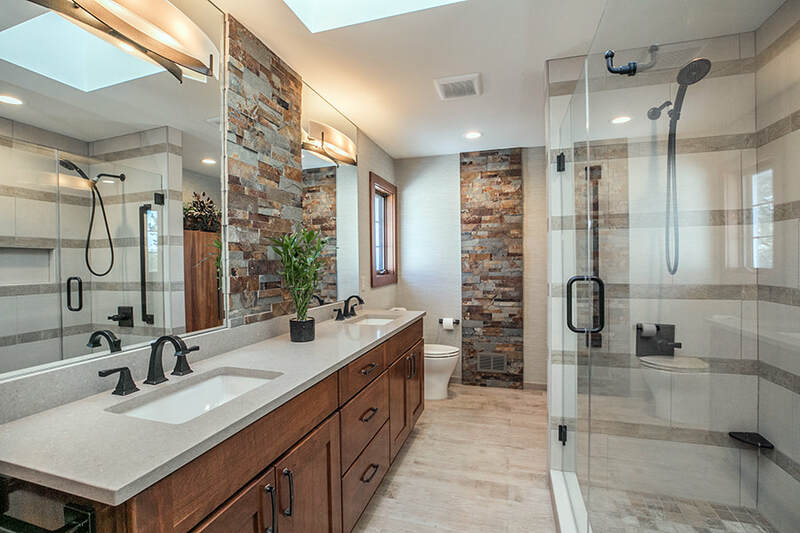 With the earth tones, wood work and accessories, this Mequon bath mimics a luxury resort bathroom with it's all glass walk-in shower and stand-alone soaking tub. 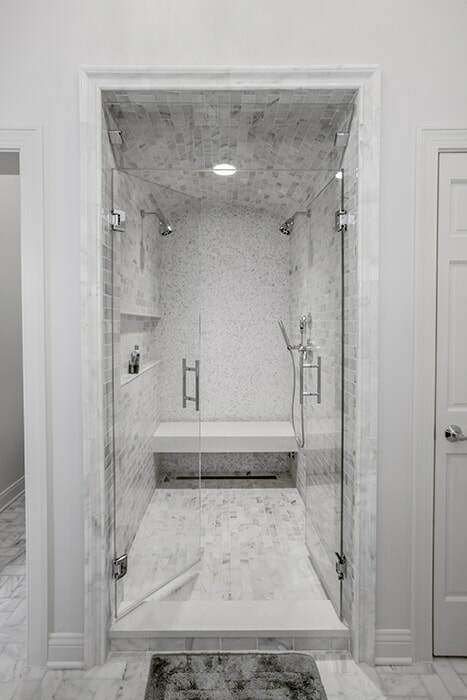 It's so satisfying for us when approached by clients asking for a "update" to their bathroom, then we provide an amazing transformation they weren't expecting was possible. 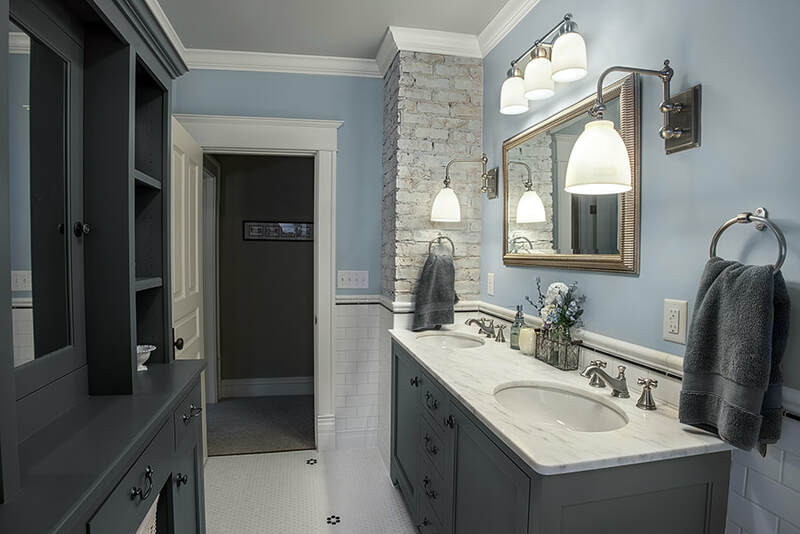 These two bathrooms in a Mukwonago home are great examples. 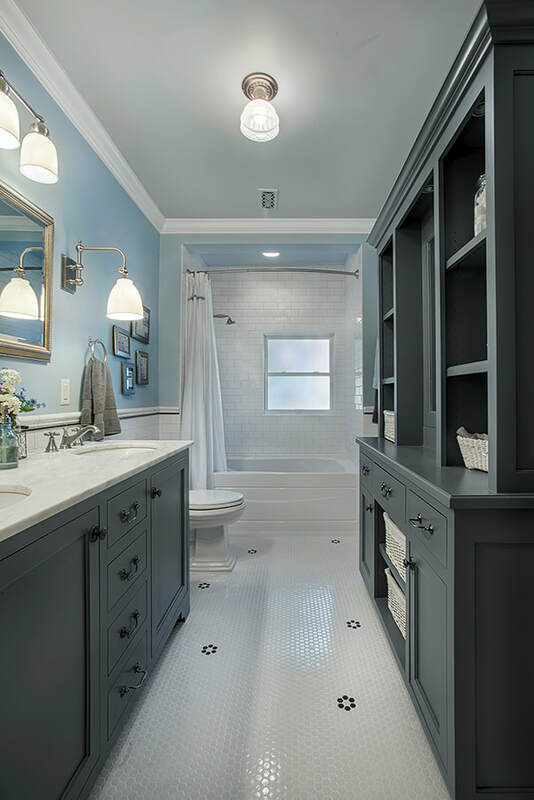 Both use a great blend of tile work, design elements like wainscoting, bold colors, and quality fixtures, hardware & cabinetry to transform each room into a stylish and contemporary space. 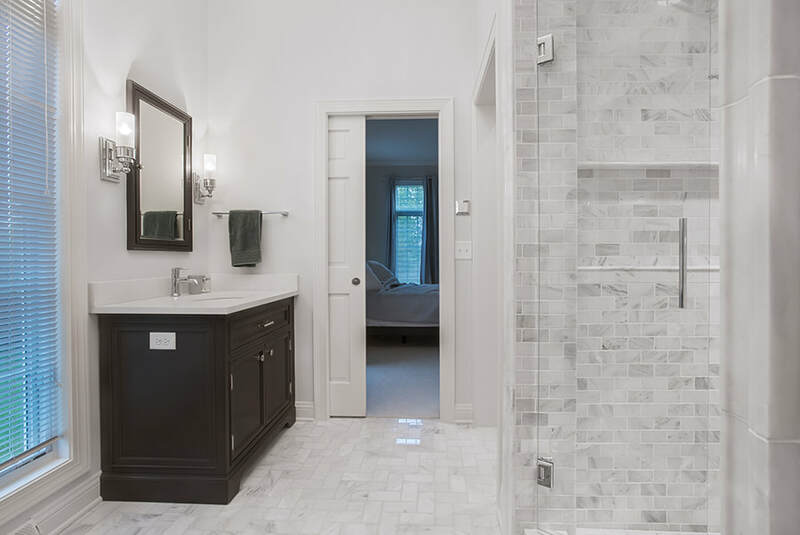 While the layout is the same, every other part of this Thiensville bathroom was updated, with amazing results. 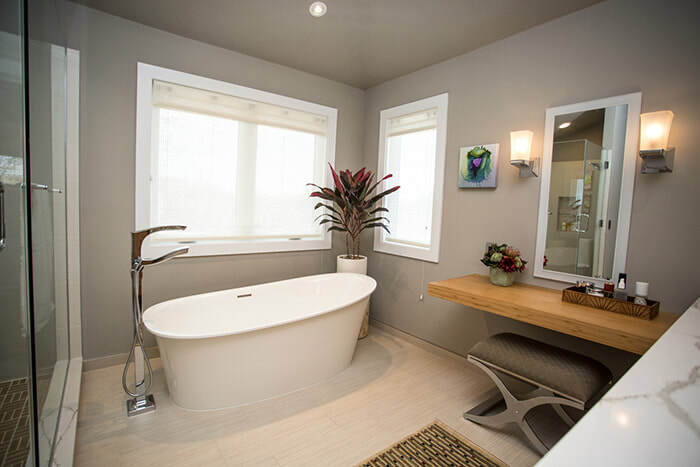 A dramatic tub design with wood accents adds a level of sophistication, while the walk-in tub brings a modern feel. 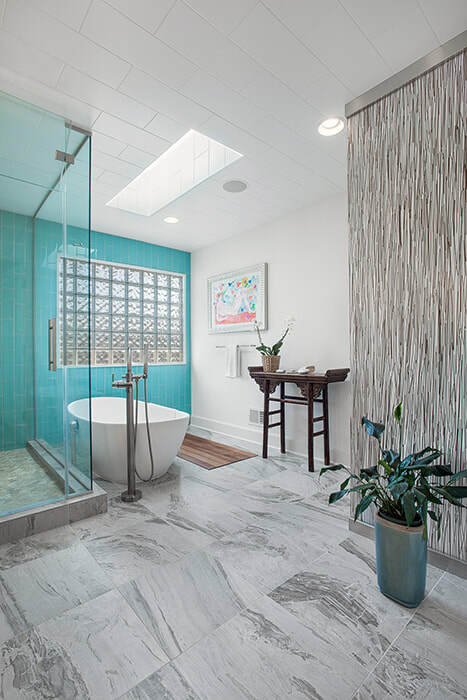 The tile work adds style and personality, making this bathroom unique and fabulous. 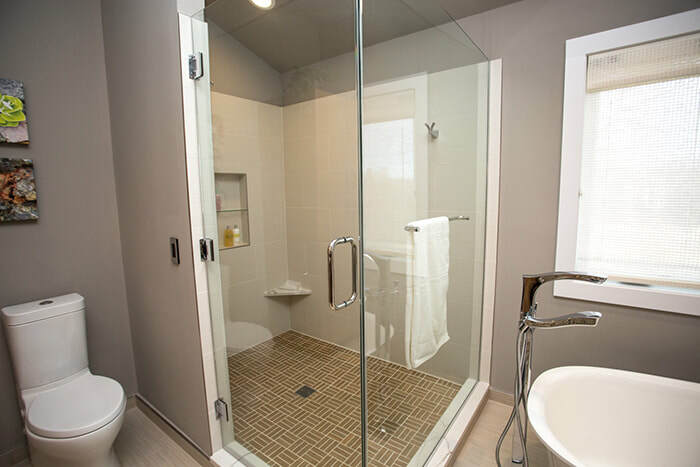 We helped this homeowner convert a main floor half-bath into a full bath, adding a tiled walk-in shower. 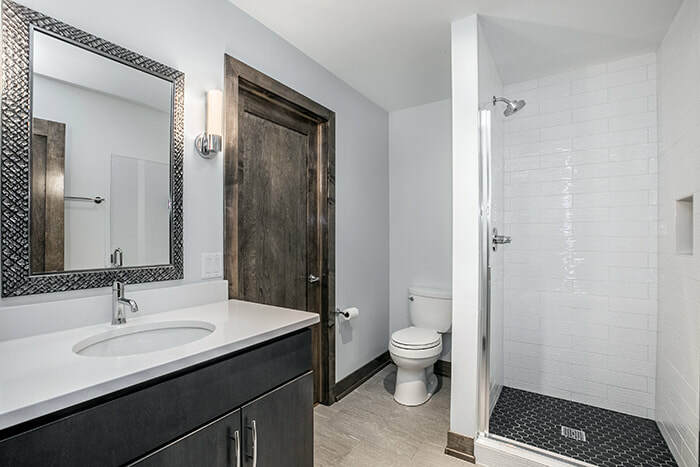 We moved the vanity to the opposite side of the room, and then stole some depth/room from a hallway closet so we could add the shower stall. 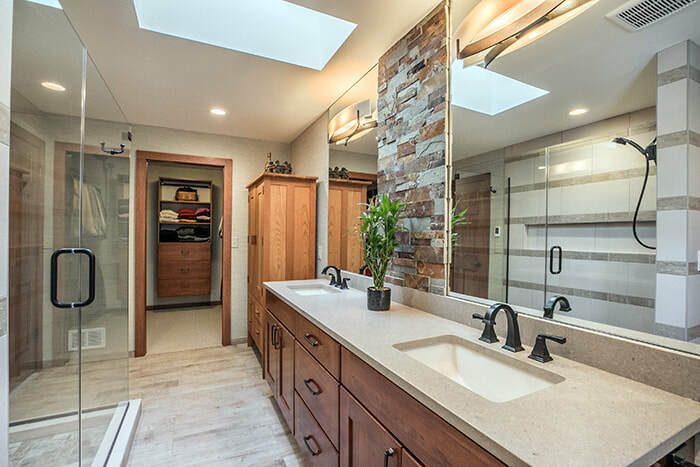 They now have a beautiful bathroom which also adds value to their home. 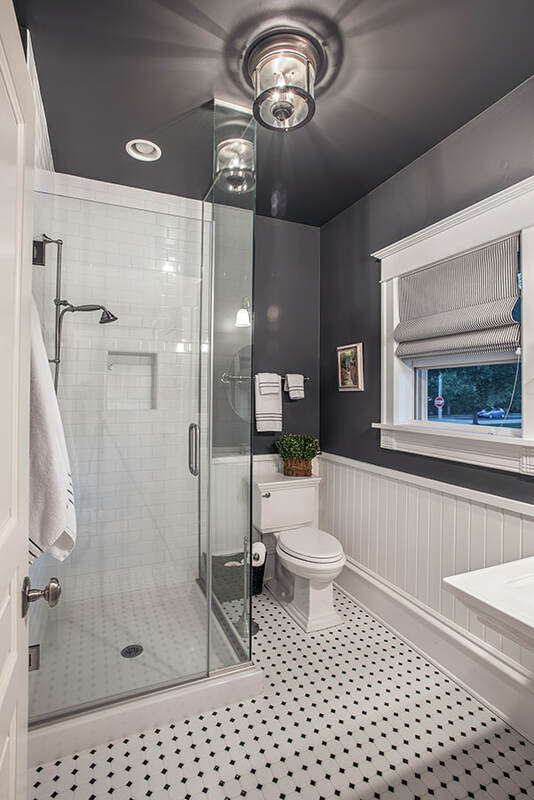 This older Milwaukee home had a dark, outdated bath with tub. 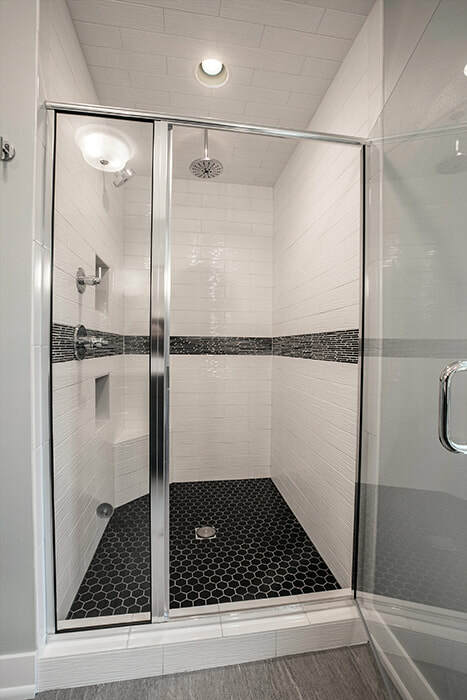 We were able to modernize it with a "No Lip" walk-in shower featuring wonderful tile work, inset shelving coves and privacy glass shower doors. 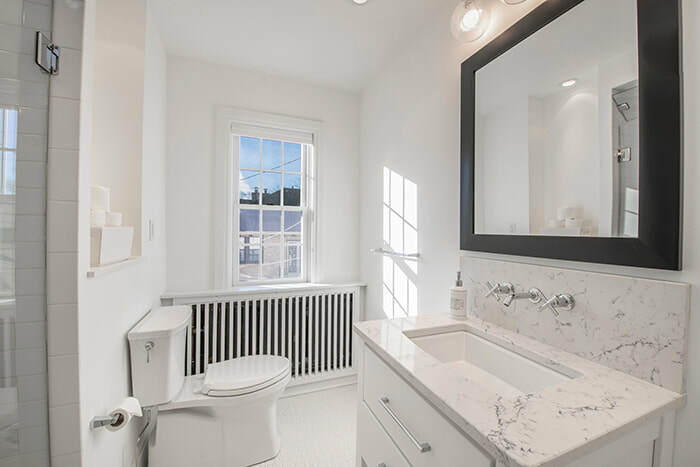 We also updated the flooring, added a new vanity with tile backsplash, and even gave them a new toilet. 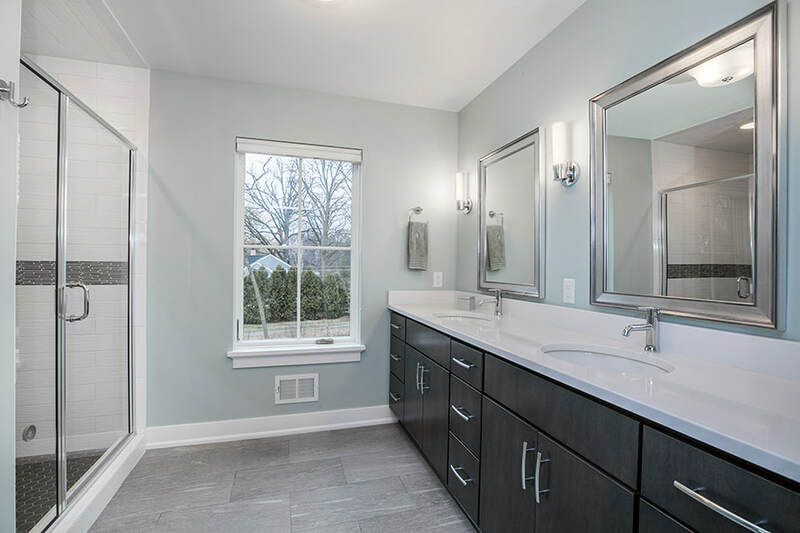 We were approached by this Franklin homeowner to update their master bathroom. 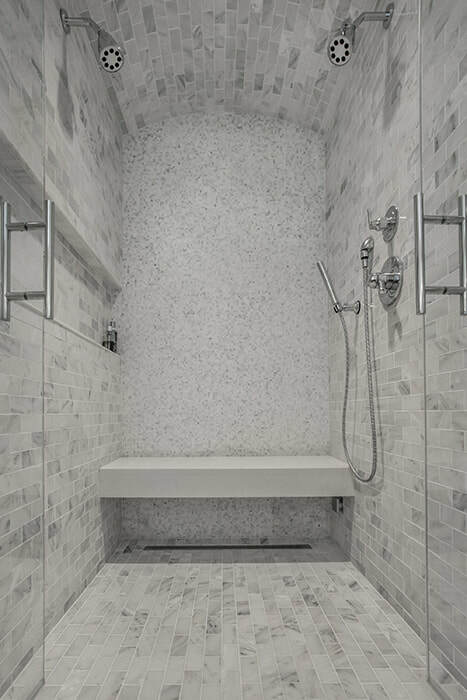 We enlarged the walk-in shower and added a bench, giving them more room and a safer space. 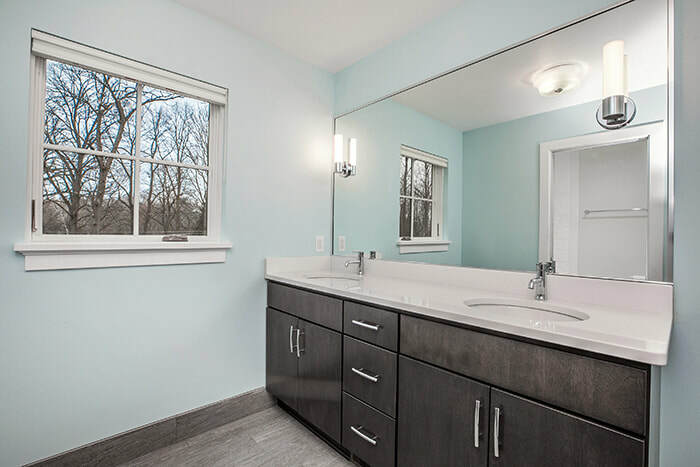 We also reduced the size of the tub and updated the vanity and flooring. 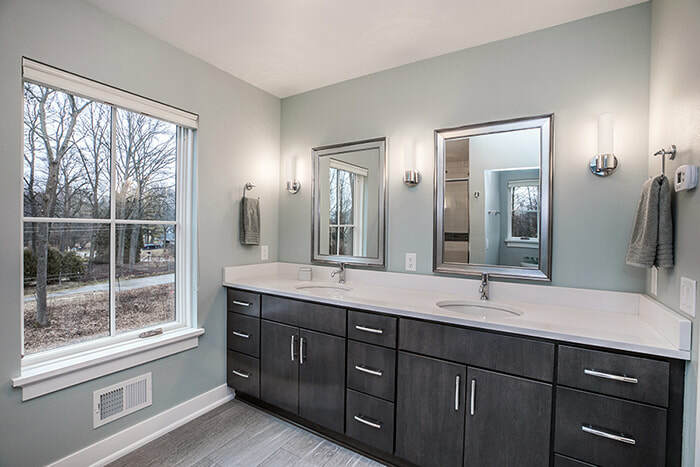 This master bath in Hartland offers unique design elements. 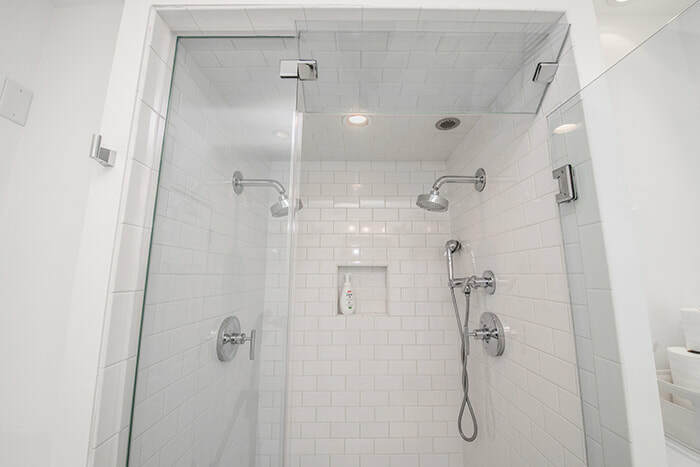 The existing tub and outdated shower stall were converted into one large walk-in shower with no lip, doors or privacy glass, yet the space is completely private. 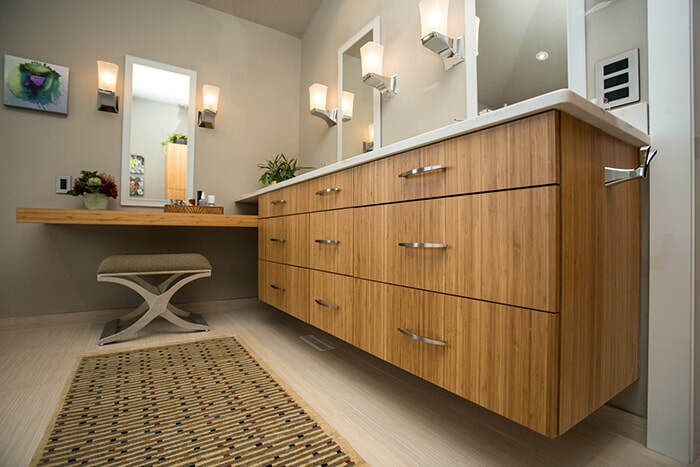 The large single vanity was converted into a double-sinks and mirrors vanity with a storage cabinet placed between the two sinks.